Shani heard an NPR story about a new book about Ted Williams called, The Kid. It’s written by Ben Bradlee, Jr., and the word often used to describe it is “comprehensive.” That’s a good descriptor. The book is 853 pages long. Now…Ted Williams is an interesting guy. First off, he’s in the running for the best hitter of all times. His career On Base Percentage (OBP) is higher than anyone in baseball history. But there’s way more than that. Twice during his baseball career, he dropped out to be part of various war efforts (WW2 and Korean War) to join as a fighter pilot, of which he was highly decorated. After his baseball career he was a championship fisherman. Plus (and this is always important for a good biography) he was a total disaster of a human being. To top it off, his body was cryogenically frozen after he died. This was part of a bitter dispute between his kids. So all that makes for a good book, right? That’s some cool subject matter. I hadn’t read anything about Ted Williams, so it seemed like a good call. It started out terrific because the intro was actually about the cryogenic freezing. Apparently there’s some lab in Arizona where you can pay $60,000 to have your dead body frozen. The idea is that when the technology is developed where they can bring you back to life, you can be thawed out. But here’s what’s so damn funny. Part of the process is that they sever the head from the body and store it in a separate frozen container. So your head and body are frozen separately. Meaning, not only do they need to develop the technology to bring you back to life before they thaw you out, but they also need technology to re-attach a head. Ted William’s Aunt Veacy sometimes went by the name Mae. And get this: she also went be Vivian too! I couldn’t believe it. But wait, there’s more: His cousin, Gennaro, sometimes used the name Gin. I got to page 35. At this point I was thoroughly lost amongst the roll call of cousins and aunts, and ready to find a shorter Ted Williams book to read. The answer (and more) in the next post. So much to read and so little time so I never hesitate to put a book down that I’m not liking. 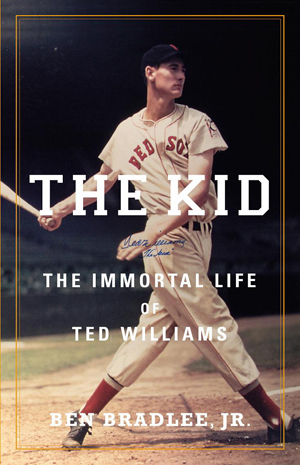 And I know Ted Williams was a complex person but 800+ pages of him?? Abraham Lincoln maybe but not Ted Williams. My chef recommended this book. Not my cup of tea but I immediately thought of you. I have a book on baseball uniform numbers. Apparently, the Yankees were the first to use numbers on uniforms, and initially the numbers represented the batting order. That’s why Ruth was no. 3 & Gehrig was 4. Question: what was the highest uniform number to win a batting title ?